Sustainability is a term we often use to criticise fast fashion and single-use plastics, not so much when it comes to homewares. Yet 99% of the things we bring into our home are discarded within 6 months. That's shocking. Homewares is an area where many of use over-consume. We're filling our homes with meaningless stuff we don't need only to toss it out in a few months time. We end up buying things for the moment and then end up with lots of stuff we don't love. Our homeware habits have become just as unsustainable as our fashion habits but no one is talking about it. I have to admit, despite owning plenty of second-hand furniture, how I choose to decorate my home wasn't something I gave much thought to in terms of sustainability - until recently. 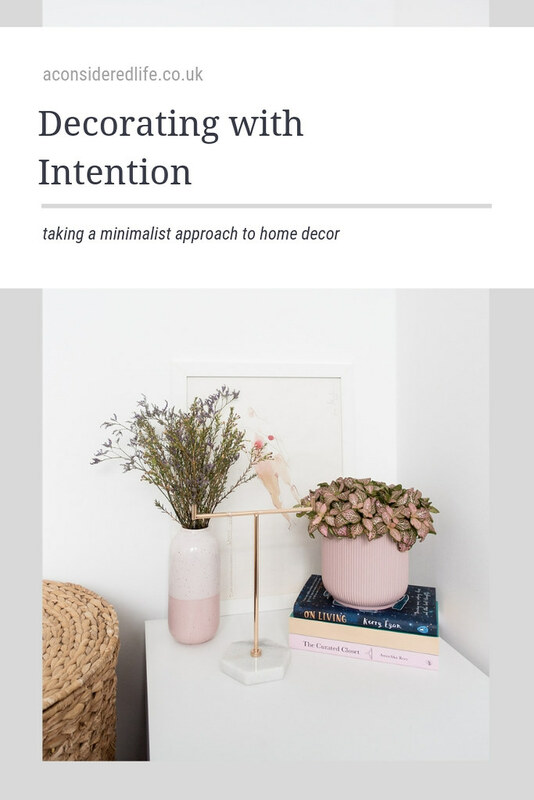 It's so important to shop with intention no matter what we're buying; whether it's the clothes we wear, the food we eat, or the furnishings we put in our home. If you want to decorate your home sustainably, the first step is to stop buying new things and start using and repurposing what you already have. 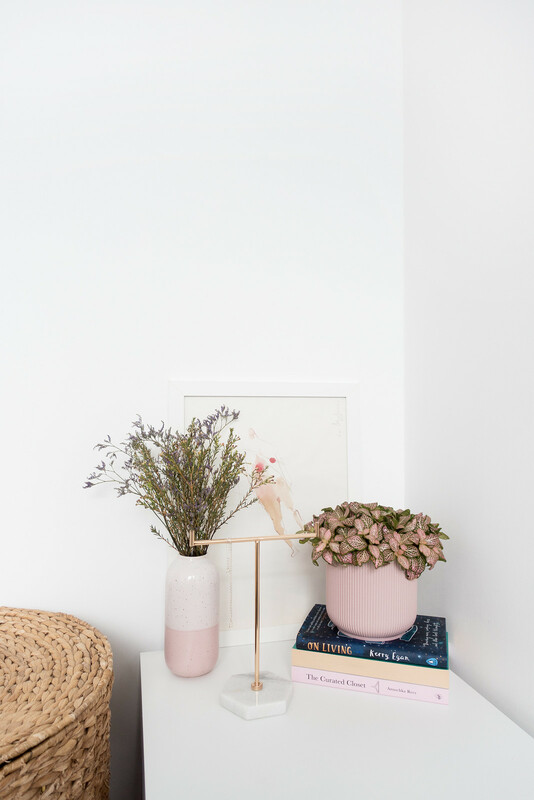 Here are my simple tips for decorating with intention and making your home more sustainable. Cheap paint isn't worth the extra elbow-grease required to apply multiple coats and toxic paint isn't something you want to be putting on your walls. Before you even start to consider furnishing your home, if you've got painting to do, look for non-toxic eco-friendly options like Earthborn or Nutshell Paints. I wish I'd heard of these brands before I moved into my new apartment, now I do I'll be sure to pass their details on to anyone else who has some painting to do. There are so many cabinets, bookshelves, and tables available in second-hand shops, as well as limitless refurbished white goods, you'd find it difficult to argue you couldn't find anything appropriate to furnish your home. However, having the time and patience to wait it out until you've found the right piece, especially one that fits exactly where you need it to, can be difficult to negotiate. So if you're unable or unwilling to furnish your home entirely with second-hand furniture, the next best option is to shop from sustainable homewares brands. Choose natural materials, like wood and bamboo, instead of plastic and opt for cruelty-free materials. If you have furniture you're thinking of getting rid of, see if you can upcycle or repurpose it before letting it go. A chest of drawers I've had for years has been moved about my apartment countless times, housing everything from clothes to photography equipment before becoming a drinks cabinet. Often we have exactly what we need already in our home, if we just apply a little imagination to how we could reuse those items. Some things are appropriate to buy second-hand, others are a little more risky. If you're on the hunt for duvet covers, bed sheets, and pillowcases, buying new is a more realistic (and appealing) option. Pick sustainable fabrics like organic cotton, bamboo, linen, or hemp from eco-friendly brands, and whether you've buying new or pre-loved, avoid synthetic materials as these will shed microplastics when you wash them. I have a couple of blankets and throws passed down to me from my mother but if I found myself in need of new ones to keep us warm on the sofa or weigh down the duvet on a cold night, I'd seek out pre-loved wool blankets from second-hand shops - there's an abundance of them. Cushions are one of those impulse purchases a lot of people succumb to so if you like to plump up your bed with them, you'll find plenty of beautiful cushions in charity or thrift shops; a quick wash and they're as good as new. As beautiful as flowers are, houseplants provide much more longevity and are a beautiful way to decorate your home. If you love fresh bouquets too much to give them up completely, choose a service from an eco-friendly brand, like Posy & Posy, who use recyclable and compostable packaging; just remember to make the most out of your bouquet. There's an abundance of vases, plant pots, and other decorative items available second-hand, in shops and online. A quick search and I'm certain you'll find exactly what you need. Alternatively, you could choose to support independent designer-makers and decorate your home with handmade goods such as original artwork, prints, and ceramics. I have a joyous mix of second-hand pots and vases, handmade ceramics and art. These made-by-hand items much more character than their store-bought counterparts. Buying a good diffuser requires a bit of investment but is well-worth it for the effectiveness. Not only are diffusers eco-friendly they're also more cost-effective. The fragrance they produce disperses further and is longer lasting than candles, while the natural oils are more environmentally-friendly. Try out some of these mood-boosting blends; I love eucalyptus and tea tree for a fresh smelling home. A lot of essential oils are, unfortunately, not appropriate for cat (and other pet) owners so if you want to keep your home smelling lovely with candles, make sure to opt for plant waxes like soy or rapeseed for a sustainable and clean burn.